When John Lynch chartered the town of Lynchburg in 1786, the 45 acre town included today's Commerce, Main, and Church Streets bounded on the east by 12th Street and 5th Street to the west. With the entire town on a hill sloping down to the James River, the area was sometimes called Lynchburg Hill. After the Court House was completed in 1813, it was discovered that the court building was not in the town's limits. In 1814 the town boundaries were extended an the name Court House Hill came into use. 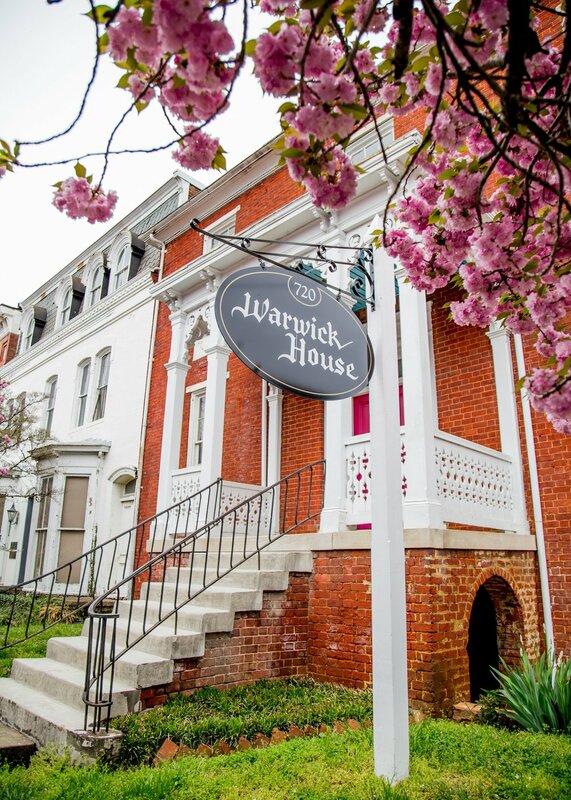 Court House Hill saw a number of early homes built with the John Warwick Daniel House completed in 1826 and the Carter Glass home on Clay Street in 1827. An important asset was added in 1829-the town funded a water system that took water from the James River and pumped it to a reservoir at 7th and Clay Streets. By 1830 the town had 4,600 residents and one of the earliest water systems in the nation. 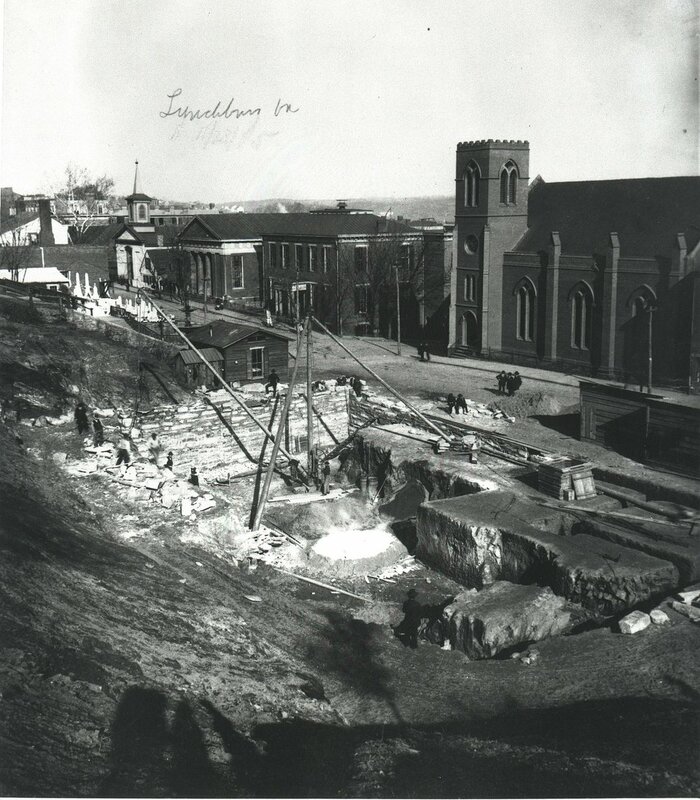 In 1855, the second Lynchburg Court House was built on the site of the original with a view down Water Street to the river where Lynch's Ferry stood. In 1977, the second court house became the home of the Lynchburg Museum. showing progress on the construction of the new United States Court House and Post Office (Monument Terrace building). Just to the left of the construction site, you can see the steps of Monument Terrace. A number of churches were originally built on what became Church Street, but by the mid-20th century all had moved to other areas of the city. After 1880 large Catholic, Baptist, Methodist, Presbyterian, and Episcopal churches were built on Court and Clay Streets in the Romanesque and Gothic Revival Styles. 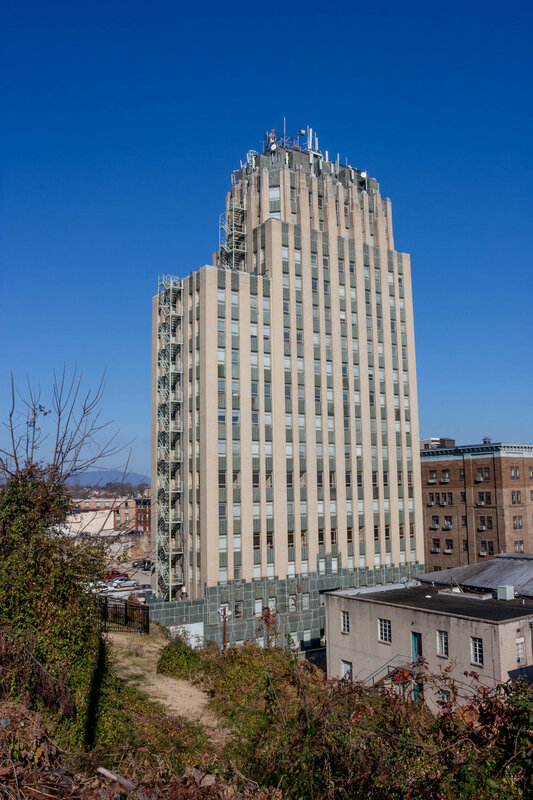 Rising 17 stories, the Allied Arts Building was Lynchburg’s tallest skyscraper until 1972. It features distinctive yellow brick and locally sourced greenstone. As the 20th century began, Lynchburg had 19,000 residents and a new surge of development. The Academy of Music opened in 1905 on Main Street and brought nationally known talent to its stage. A new post office and several schools were built. The neo-classical Lynchburg National Bank opened at the corner of 9th and Main Streets. As a memorial to World War I dead, Monument Terrace was completed in 1925. Court house hill now had a grand stair to connect Church and Court Streets. Lynchburg's Downtown was the center of government, commerce, and entertainment from founding through the 1970s, but as shopping centers were built, Downtown gradually faded with most retail, restaurants, and entertainment moving to other areas of the city. Beginning in the 1980s and gaining momentum each decade since, Downtown is coming back to life as the heart of Lynchburg.